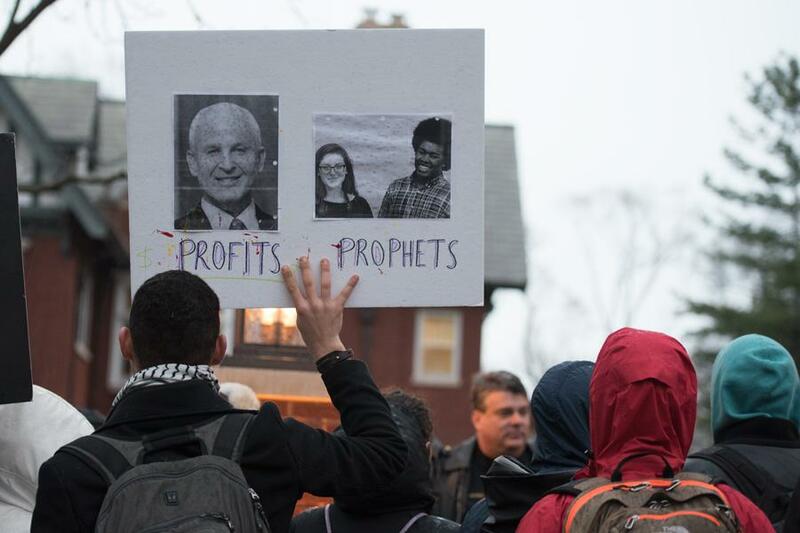 Student activists gather outside University President Morton Schapiro's house. While protesters marched to Schapiro's Orrington house, Schapiro was holding a dinner for students, including ASG members. Student activists protested Northwestern’s investment policies Tuesday evening, both by marching to and walking out of University President Morton Schapiro’s Evanston house. Schapiro was hosting a dinner for members of Associated Student Government when roughly 30 student activists gathered outside his home at 2601 Orrington Ave., waving signs and shouting demands. The protesters — some of who chanted “Morty, come outside!” and “No justice, no peace!” — listed demands and called on Schapiro to pressure the Board of Trustees to “divest from corporations profiting off human rights violations,” especially those operating in Palestine. Inside the house, guests ate hors d’oeuvres and chatted before sitting down for dinner. Then Schapiro stood to give a speech. Students present at the dinner told The Daily that Schapiro outlined changes the University has made in its investment policy, saying he favored divesting from fossil fuels, and that he pushed trustees to do just that. But the Board, he said, declined to take that action. Shortly after Schapiro’s speech, some students stood and said administrators haven’t done enough on divestment, ending their critique by walking out of the house. They joined the protesters, huddled on the sidewalk, and continued to shout demands. SESP freshman Ben Powell, who walked out of the dinner, said that although Schapiro said he supported divesting from fossil fuels, he didn’t mention other divestment campaigns. The protest lasted for roughly an hour, and Schapiro did not come outside to speak with protesters. Two of the students who walked out of the dinner are a ticket in ASG’s presidential race. Christina Cilento, a SESP junior, and her running mate Macs Vinson, a McCormick junior, both left Schapiro’s house and spoke about it later Tuesday during a debate. Three divestment campaigns are currently pushing for changes to the University’s investments: In early March, ASG Senate passed an Unshackle NU-sponsored resolution that calls on the University to divest from corporations the group says promote mass incarceration. Last February, after a tense five hours of debate, Senate narrowly passed a Northwestern Divest-sponsored resolution that called on the University to divest from six corporations the authors say violate Palestinians’ human rights. As for coal divestment, Fossil Free NU has pushed the University to divest from fossil fuels since November 2014. In an online referendum held during ASG’s presidential election in April 2015, almost three-quarters of voters said the University should divest from coal. 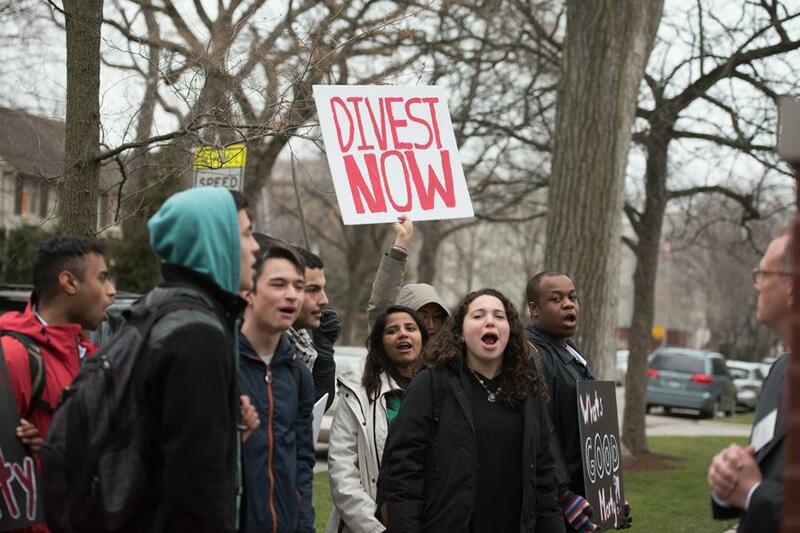 Divestment movements at Northwestern date back decades: In the 1980s, student activists lobbied the University to divest from companies doing business in Apartheid-era South Africa. Later movements targeted corporations operating in Burma and Sudan, both of which activists said violated human rights. During much of Tuesday’s protest, Dean of Students Todd Adams stood in front of the crowd, listening and sometimes speaking with protesters. He said it’s “paramount” that administrators listen to students. This story was updated at 9:15 p.m. with quotes from Todd Adams and student protestors and at 1:39 a.m. with additional details.